Another event to let you know about: Global Cotton Connections of the Derwent Valley: creative reflections. Have you seen the new exhibition from the Archives Team at De Montfort University? The exhibition takes a chronological look at prospectus design for the college and later university from 1897 to the present. There are some interesting hairstyles (no prizes for guessing which decades these are from!) and some interesting design concepts over time. I wonder how people in 100 years time will appreciate the more recent prospectus showcased in the exhibition? You can also follow their blog, which includes a regular ‘Object of the Week’ and details of the Archives and Arts collection, as well as their new Heritage Centre built around the arches which are all that remain of the medieval Church of the Annunciation, where the remains of the late Richard III were displayed for two days after his death at Bosworth in 1485. I visited the Centre just over a week ago, and can recommend it if you are in Leicester, it really gives a new perspective on the common misconceptions about the “old polytechnic” universities. Today, I have finished numbering a series that was in a folder, which I decided to keep together to help users with context of the items, and some maps, which are not included in the 21 boxes that I have usually been talking about. I have also made sure that the location guide used to find the items was up to date, including finding the location of the shirt, which was repackaged by the conservation team (there is an image of this shirt in a previous post) to add to my location guide. This project has been a bit of a rollercoaster for me as a trainee archivist, I have learnt a lot, especially the fact that as the project has progressed, I have grown by making mistakes, and then correcting said mistakes. That is me for now, but I will write regular posts on my other projects soon to show the day in the life of a trainee archivist. 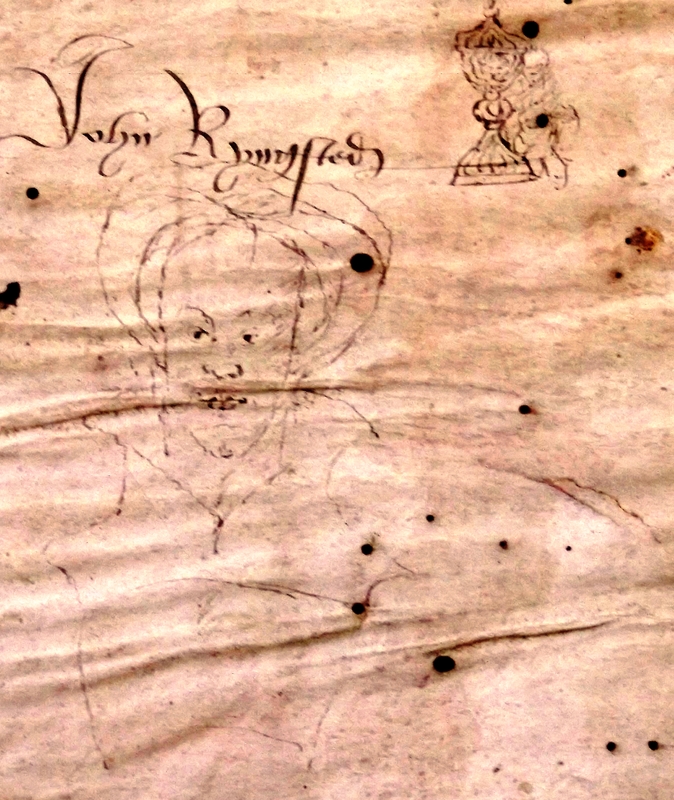 John Ryngsted: a 500-year old sketch portrait? I had made up my mind to skip my usual Friday blog-post this week, but a researcher in the searchroom has just shown me something which seems worth sharing right away. It was found in a book that would go right over my head: the legal precedent book of Sir Robert Drury of Hawstead, Suffolk (c1455-1535). Drury was a distinguished lawyer and royal servant, and for a time speaker of the House of Commons. The book was, according to our catalogue “apparently drawn up in Sir Robert Drury’s life for him or by a confidential clerk in his service”. 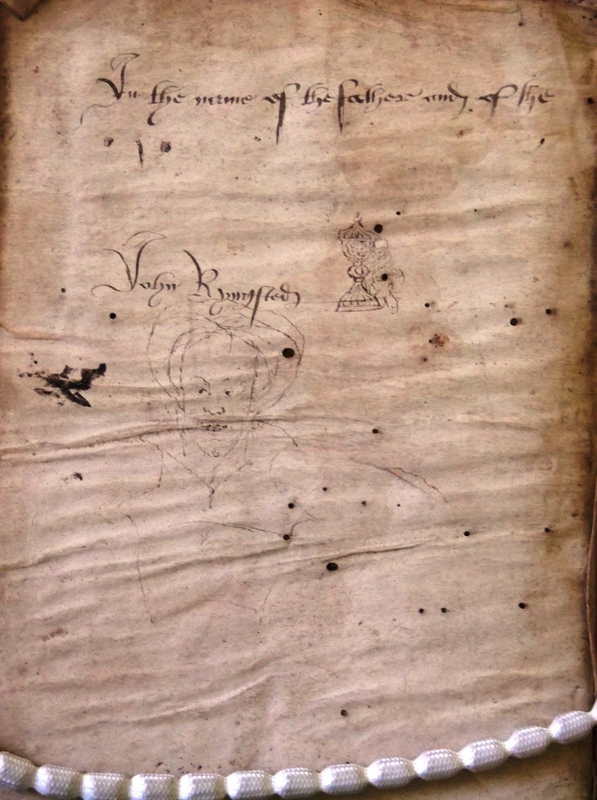 However, although the catalogue originally mentioned the fact that the back flyleaf bears the name of one John Ryngsted, it did not mention (until I added it just now) the little portrait, which has been faintly inked on to the same page – so faintly, you may struggle to make the image out clearly. A portrait of Mr Ryngsted, perhaps? Even a self-portrait? And what do you make of his get-up? In addition to researching my house, I also looked at documents relating to Smedley’s Hydro. What is now the County Hall in Matlock was once the hydro of John Smedley were people can come and relax with the water treatments, known as Smedley’s Hydropathic Establishment. Here are a few photographs from an old brochure for the hydro, showing it was surprisingly lavish and elaborately decorated. As a student on work experience at the county record office I always wanted to find my house on a map to see if it was there or not. Therefore I decided to look for it on an 1848 tithe map. After a short while I concluded that this was my house (see map on left). The reason why I knew that my house would be on a map like this was because the previous home owners told us that the house dated back as early as the seventeenth century. The map was really exciting because it was evidence that the house was there at that time and it backed up what the previous home owners said. 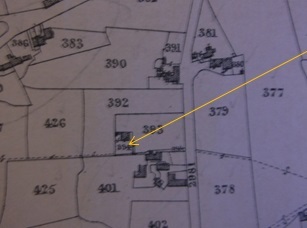 After that I found my house on the tithe award showing the plot number (394) and the home owners who owned it. In 1848 George Keeling was the occupant of the house with a court, privy, road and garden! 167 years from then the house is still occupied (and standing!). If you have been following my blog each week you will already know that I have been organising a collection that was donated to the Derbyshire Record Office between 1975 and 1976. As a trainee archivist I am prone to making mistakes, and this has been the project that has taught me the most; and has been a way I can practise all the theory that I have been reading on my Master’s course. I naively made a miscellenous box, which months later I was required to go back to and individually put them into CALM ready to be published on the catalogue. I did not organise the structure of the collection properly, which, if it had been left like that, would have made looking for similar documents more difficult. Weeks later, I now have a collection that has all the items (all 414) either individually mentioned, or grouped together (with photographs this has happened). They have been grouped together with similar documents in series and subseries (made my head spin during this stage). The extent (how many items there are) has been filled in and all items have been given the date that they were created, or a rough estimate if the date has not been stated. Now I am required to start adding the reference number to each of these items, which I started months ago. Luckily for me, the items that I had already written the refernce number on do not need to be changed (thank goodness!) 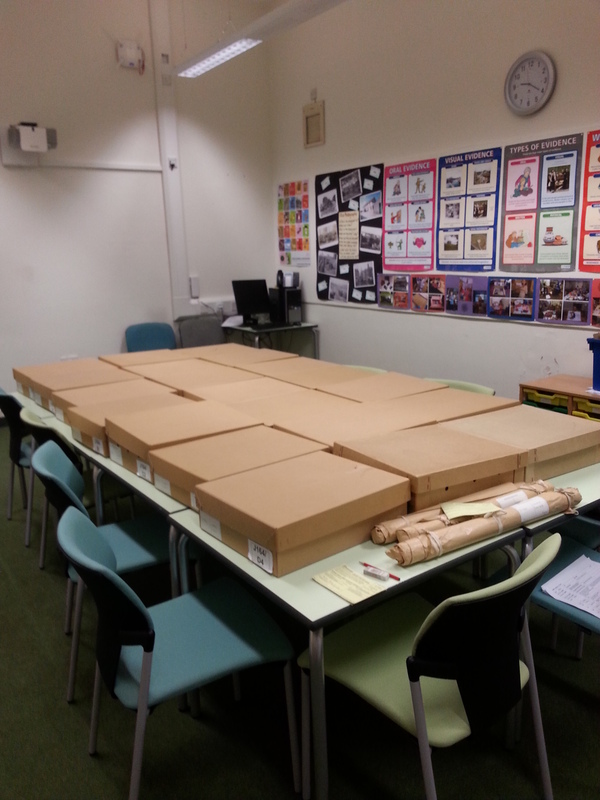 Whilst in the process of numbering the documents, they will also be reboxed together. For those of you who missed my first blog, the picture below is the 21 boxes that is this collection. 12 boxes have already been numbered and reboxed. Next time I am at the Derbyshire Record Office, the daunting task for completing the last 9 boxes will commence.